The Lumix DMW-YAGH Interface Unit for GH4 from Panasonic is designed to give the Lumix DMC-GH4 camera the video, audio, and power connectivity required for professional video workflows. When attached to the GH4, the Interface Unit has 2 monaural XLR inputs for line or condenser microphones, and gives you independent volume control of the left and right channels. There is also an audio level display monitor and +48V of phantom power for each channel. When it comes to video outputs, the Interface Unit provides four BNC connectors – two 3G-SDI capable and two HD-SDI capable. It outputs quad-link SDI 4K video in 4:2:2 10-bit, dual-link 4:2:2 10-bit 1080p up to 60 fps, or four simultaneous 1080p streams up to 30 fps – all with timecode. 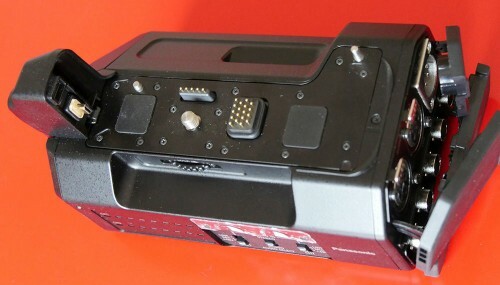 The Interface Unit also has a BNC connector for timecode input, and converts the GH4’s micro HDMI output to a full-sized HDMI output. For power, a 4-pin XLR 12VDC input is available. 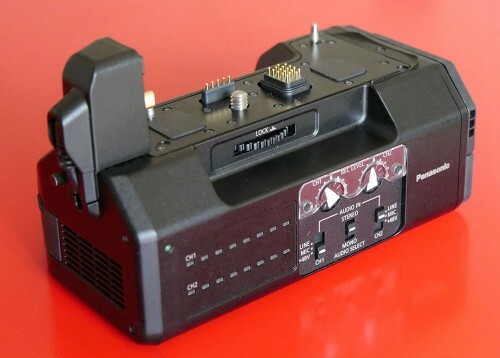 Note: The Interface Unit is not powered by the GH4 and requires an external 4-pin XLR 12VDC power source for use. Note: When using 4:2:2/10-bit output, simultaneous video recording to an SDHC/SDXC memory card in the DMC-GH4 is not possible.